This entry was posted in news and tagged Configurator MINI Clubman MINI USA on September 25, 2015 by James Day. MINI USA updated its Configurator to include the new MINI Cooper Clubman and MINI Cooper S Clubman which launches in Europe on October 31st but doesn’t arrive in the US until later this year. Colors available to build include Pepper White, Chili Red, Pure Burgundy Metallic, Melting Silver Metallic, Midnight Black Metallic, British Racing Green Metallic, Moonwalk Grey Metallic, Blazing Red Metallic, Lapisluxury Blue, and Thunder Grey Metallic. 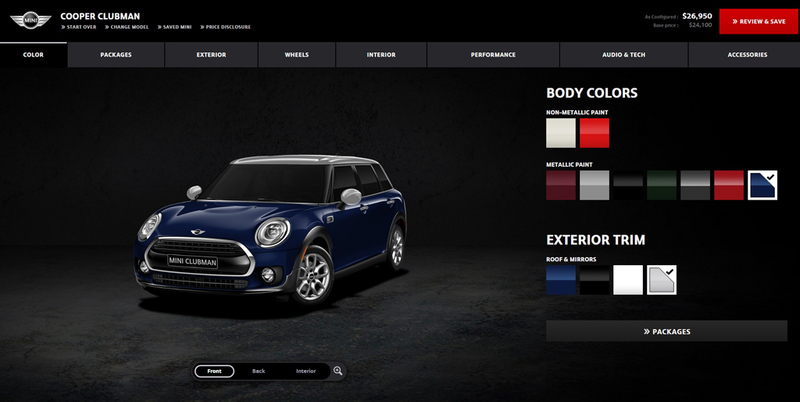 Shown in the MINI UK Configurator but not in the US is Volcanic Orange and Deep Blue Metallic. Roof colors available are body color, Black, White, and Silver. Build a MINI Cooper Clubman or MINI Cooper S Clubman at MINIUSA.com.